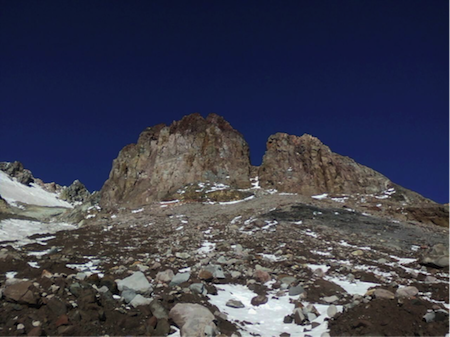 On October 3, 2014, a 27 year-old male visiting from St. Louis set out from Timberline Lodge to climb Mt. Hood. The day was clear and unseasonably warm, and the individual was wearing only gym shorts, a T-shirt and running shoes. He had with him a warm hat and an insulated jacket. He had very limited climbing experience. On his way up the mountain, he encountered a Chris Carter, a climber who was descending. Mr. Carter observed that the subject was lightly equipped. He exchanged cell phone numbers with the subject. 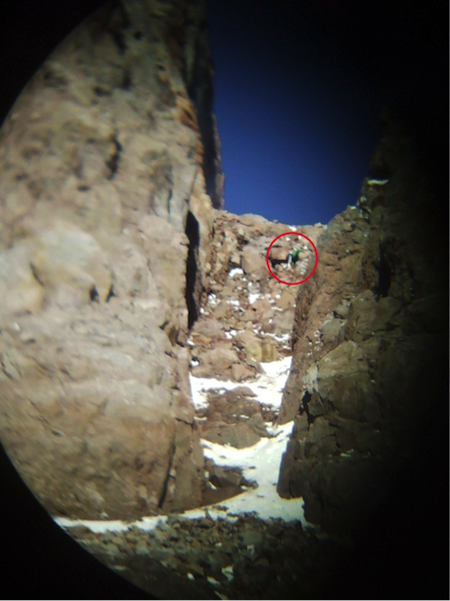 He also took a photograph of the subject as he began ascending the southwest gulley on Crater Rock (see below). The subject apparently climbed to a point in the gulley where he did not feel he could safely go further up or descend. He eventually called Mr. Carter and explained his predicament. Mr. Carter then called 911 and reported the subject’s call for help and his limited equipment. After the call to Mr. Carter, the subject’s cell phone batteries died. Around 6:30 p.m., the Clackamas County Sheriff’s Office requested Portland Mountain Rescue to rescue the climber. 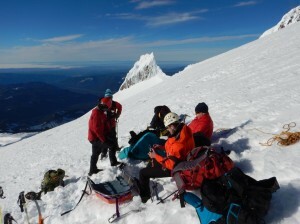 By 9:15 p.m., a PMR team of five rescuers and two AMR Reach and Treat medics left Timberline. They were transported first by truck and then by snow cat to the top of the Palmer Lift. Under clear skies, they ascended to Crater Rock. Aided by the photographs provided by Mr. Carter and a bright moon, they located the subject. Approaching the subject required climbing in the dark through an area with dangerous rock fall potential. Two rescuers climbed to the subject’s position and reached him around 12:30 a.m. Saturday morning. The subject had moved from the gulley to a slightly more secure point and hunkered down behind some old boards he found near the historic engine left many years ago on the mountain. Temperatures were in the low 40’s or high 30’s, so the subject was cold, but had no injuries. The rescuers warmed him with a heating blanket and provided him food, warm clothing, a helmet and a harness. They then helped him around Crater Rock to the standard south side climbing route. The remaining rescuers rappelled from a point lower on Crater Rock, and the groups reunited below Triangle Moraine. They escorted the subject to the top of the Palmer Lift by 2:30 a.m. and arrived at Timberline Lodge at 3:15 a.m. Saturday morning. The subject was very fortunate that he encountered Mr. Carter earlier in the day and that Mr. Carter thought to photograph the subject’s position in the southwest gulley on Crater Rock. Otherwise, the subject could have been extremely difficult to locate. The subject is also fortunate that unseasonably warm and fair conditions prevailed through the night. In September 2013, two friends were exploring the Big Lava Flow south of Goose Lake in the Gifford Pinchot National Forest. They were searching for a lave cave amongst the exposed lava flow. The two became separated and the surviving friend was unable to find the missing friend. The search effort was eventually terminated in 2013 with the missing individual presumed to be deceased. During the week of September 8, 2014, the Skamania County Sheriff’s Office planned a new search of the area and requested Portland Mountain Rescue to assist in the difficult terrain. On the first day PMR lead two teams totaling 37 searchers from many regional search and rescue units. They completed a coarse grid search of a large portion of two search units near where the subject was last seen. On the second day, PMR lead a single team of 21 searchers from three regional search and rescue units. They performed grid searches immediately around the point where the subject was last seen. During these searches, we were reminded of how difficult navigation can be in rough terrain like an exposed lava flow. We also were reminded how easy it can be to stumble and suffer serious injuries around rough lava rocks. Such areas are beautiful and worth exploring, but only for experienced back country users with excellent navigation skills, and then only if they stay close together. On July 12, 2014, Edwin Birch (64) and his son Zack Birch (37) started a day hike of a section of the Wonderland Trail around Mt. Rainier. Edwin dropped off Zack at the Summerland Trailhead, from which Zack hiked south alone. Edwin drove on to the Olallie Creek Trailhead, where he parked the car and proceeded to hike north. The two planned to meet on the trail, transfer the car keys to Zack and then rendezvous where Edwin would exit at the Summerland Trailhead. They met at the Ohanapecosh Park area and then continued on their separate ways. Zack made it to the Olallie Creek Trailhead around midnight and then drove the car to the Summerland Trailhead, but his father never arrived. He reported his father missing around 1:30 on the morning of July 13. On July 14, Mt. Rainier National Park request assistance from Portland Mountain Rescue. PMR deployed a team of four rescuers early on July 15. From the Sunrise parking area, a Chinook helicopter transported the PMR team to the Ohanapecosh Park area. After commencing a search of their assigned area, the PMR team was reassigned to another area. This required an overnight bivouac and bushwhacking through difficult terrain. Completing this assignment consumed the full extent of daylight on July 15. The team finally made it out to a road for pickup around 8:30 p.m. that night. Meanwhile a second PMR team of two searchers reported to the search area on July 15. They joined a rescuer from Seattle Mountain Rescue and another from Central Washington Mountain Rescue to attempt a search an area near the Ohanapecosh River. Due to difficult terrain and bushwhacking, they were unable to reach their final objective, but searched a possible exit route for the subject. They were out of the field around 8:00 on July 15. After additional days of searching Edwin Birch has not been found. The National Park Service has transitioned to a “limited continuous search”. PMR encourages hikers who become lost to back track if they can confidently do so. If you cannot confidently backtrack and you know someone will be looking for you in the general area, stay put or move to an area that is higher or clear where you can be easily seen or heard. Traveling off trail can be dangerous, doing it alone is even more dangerous, especially with the added stress of feeling lost.